From the author of The Latehomecomer, a powerful memoir of her father, a Hmong song poet who sacrificed his gift for his children’s future in America. In the Hmong tradition, the song poet recounts the story of his people, their history and tragedies, joys and losses; extemporizing or drawing on folk tales, he keeps the past alive, invokes the spirits and the homeland, and records courtships, births, weddings, and wishes. Following her award-winning book The Latehomecomer, Kao Kalia Yang now retells the life of her father Bee Yang, the song poet, a Hmong refugee in Minnesota, driven from the mountains of Laos by American’s Secret War. Bee lost his father as a young boy and keenly felt his orphanhood. He would wander from one neighbor to the next, collecting the things they said to each other, whispering the words to himself at night until, one day, a song was born. Bee sings the life of his people through the war-torn jungle and a Thai refugee camp. But the songs fall away in the cold, bitter world of a Minneapolis housing project and on the factory floor until, with the death of Bee’s mother, the songs leave him for good. But before they do, Bee, with his poetry, has polished a life of poverty for his children, burnished their grim reality so that they might shine. 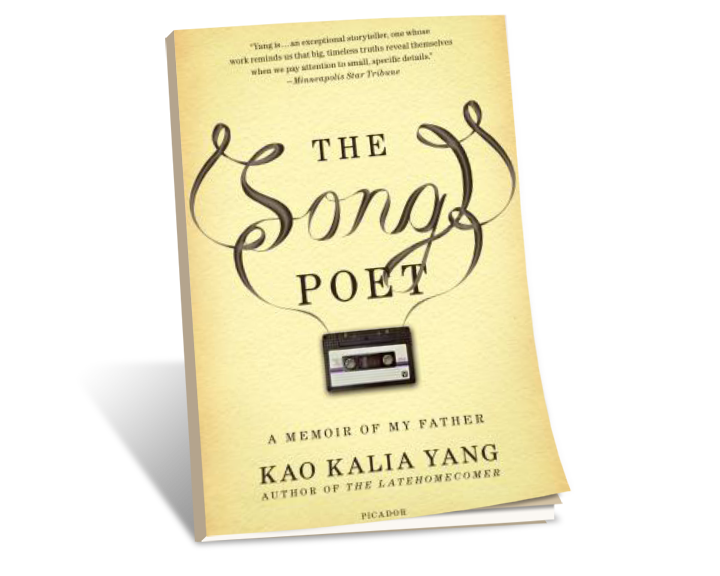 Written with the exquisite beauty for which Kao Kalia Yang is renowned, The Song Poet is a love story — of a daughter for her father, a father for his children, a people for their land, their traditions, and all that they have lost. You may order The Song Poet from the following retailers. Please click on the appropriate buttons to take you to the order page. Thank you!